If you're used to Halifax or even Toronto, the streets of downtown Istanbul are very intense. The older parts of town have narrow, maze like streets, crammed with shops, neighbourhood mosques, and all types of traffic. The newer parts have lots of monuments, mosques, and large patios. In the tourist areas, shop and restaurant staff will call out to you, haranguing you to come in to their places. After the universally understood 'Allo!' they will then try several languages on you (we sometimes got German and French before English), the good ones finding a good gimmick. A bald guy called out to me in a thick Turkish accent "Hey, I'm Bruce Willis and I love this restaurant!" - I also got "Hey Titanic!" once (not a lot of Turks have longish parted brown hair). If you stop to look the place over, they'll explain how great it is, and some make a big show of calling sub-waiters to heft over a big wooden menu board. This is all part of the schtick for tourists and is fun once you get used to it - but it's interesting to see how much it annoys North Americans and Northern Europeans. Brits looking over a menu will, when confronted by an enthusiastic host dressed up like a sultan trying to get a high-five, get a sour look on their faces and turn away. It's a shame - they're missing out on some good food. 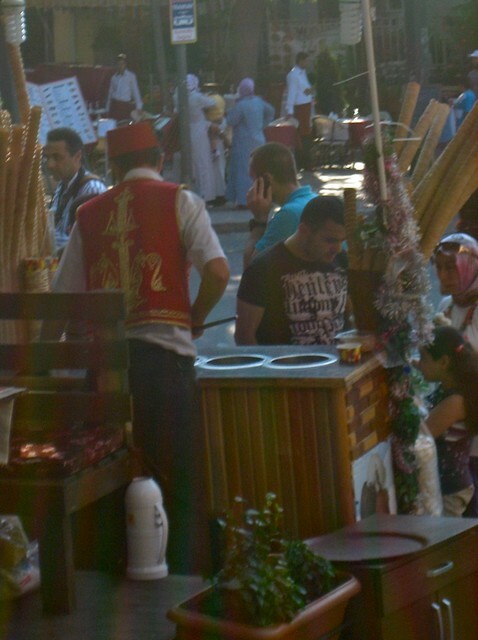 Istanbul has a specific type of ice cream vendor, found in little shops and booths all over the busier areas. He's a rowdy young man in an embroidered vest and fez, armed with a long metal rod with a scoop on one end. While waiting for customers, he'll roll and tap the rod against the counter in a musical manner, or use it to flip and knead the extra-thick ice cream in mid-air. When someone places an order, he goes to work: he plunges the rod repeatedly into the ice cream bins, exclaiming every time he goes in. The ice cream collected, he slaps it into a cone, whacks the rod into a set of bells at the top of his booth to announce to the world that another ice cream cone is on its way, and whips it back down to present the treat, suspended from the scoop by the sticky ice cream, to the startled, delighted customer. But he's not finished yet: when the customer reaches for the cone, he flips it up and inverted, out of his reach, with a smirk on his lips and a twinkle in his eye. This happens a few more times until the customer is on the verge of getting annoyed, and then it is gracefully presented one last time, and for real. It's such a popular symbol of the city that they even have one at the airport, just outside of their Disneyfied duty-free 'bazaar'. When I was in Venezuela a few years ago, there were half-feral dogs everywhere. In Istanbul, it's cats. There are small, thin cats all around the city, sometimes hanging out in small groups, sometimes just sleeping on ancient ruins. It turns out that cats are special in Islamic and Turkish culture (and other places that used to be under Ottoman influence, such as Greece, Serbia and Israel). The Prophet Mohammed was supposedly a cat person, preferring to cut off one of his sleeves rather than wake up a cat who had fallen asleep on it. Feeding a street cat is considered a good deed in Istanbul, and children love playing with kittens. Cats like restaurants and often try to sneak inside, in their ninja-like way, only to get tisked out by the staff, but then given a small piece of fish or lamb. If you're sitting on a patio, cats will often sneak under your table and give you a pleading look and a few mews. They'll eventually move on, since Istanbul is full of opportunities for a hungry cat. The scariest moment of our trip was when we inadvertently scared a cat to run out into traffic and it almost got hit by a taxi. Thankfully it missed, but we felt traumatized for the rest of the evening. It's probably not a coincidence that the big squares in Istanbul are remarkably pigeon-free. 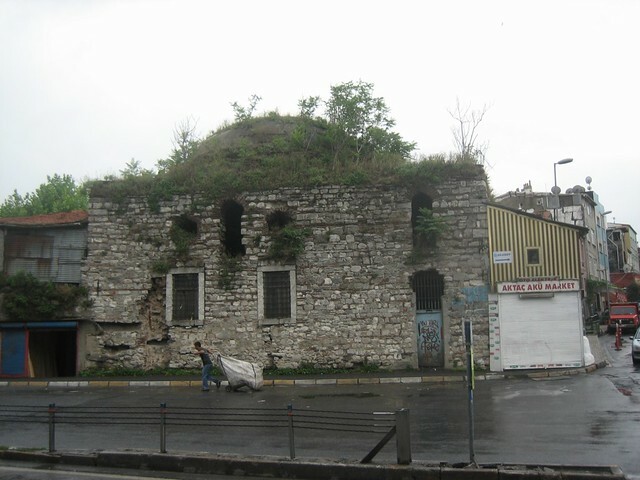 For centuries, Istanbul has been famous for its huge covered Bazaar (the original indoor shopping mall). The shopping mania has extended out into the surrounding neighbourhood. The streets in this part of town are all named (in Turkish of course) for the types of shops that used to be on it: The Street of Swordmakers, The Street of Goldsmiths, etc. All of the vendors or craftsmen of a particular type would set up shop on the same street, making it the one destination you needed to go to for silk, cinnamon, or tooth removal. They still have this pattern in Istanbul: walking around, one comes across a street entirely devoted to musical instruments (Turks seem to like their electric guitars as glam-metal as possible), or another street filled with car parts shops, or a street of little princeling coming-of-age boys outfits, or a street of bridal gowns, or a street of cell phones. I don't know whether this is by tradition or zoning bylaw. I'm guessing the former. Istanbul is in a prime earthquake zone. They also have a long tradition of building in wood. So large parts of the city have been shaken apart or burned down over the centuries. Several major buildings and monuments are 1500 years old - but they were well built in stone and are the exception. Much of the old city seems to date from the 18th and 19th centuries, with the newer city filled with many 1950s-1970s highrises. Occasionally, I would come across a decrepit building - old and architecturally interesting enough to fire up a dozen Preservation Committees in North America - just falling apart in its lot, roofless, with empty windows and piles of rubble, home to the occasional street cat.